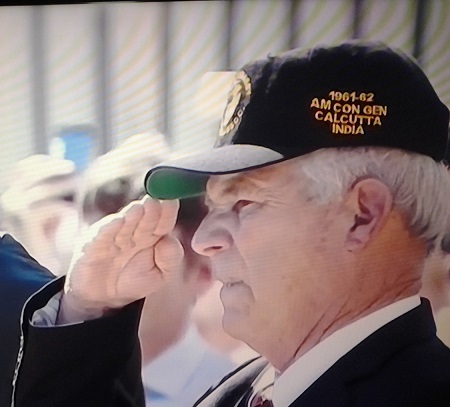 I was watching a clip of the American flag being raised in Havana for the embassy re-opening since closing in 1961. There were some retired Marines there who were there when the flag was taken down. One of them had a hat with something about Calcutta in 1961 on his hat. What happened in Calcutta that he would have this on his hat? I don't see anything about a US military base in Calcutta nor any battles. I would guess that this fellow was stationed at the American consulate general (that is what AM CON GEN stands for) in Calcutta between 1961 and 1962. So to answer your precise question: Probably not much. Not the answer you're looking for? Browse other questions tagged united-states military india 1960s or ask your own question. What happened to the US Army Camel Corps? What happened to Dada Abdullah & Co, the firm that started Gandhi's career in South Africa? What happened to the belongings of fallen Roman soldiers? What happened to the missiles of Tipu Sultan?